My fourteenth ground of 2018 was on Tuesday 1st May at East End Park in Dunfermline, Fife, Scotland. 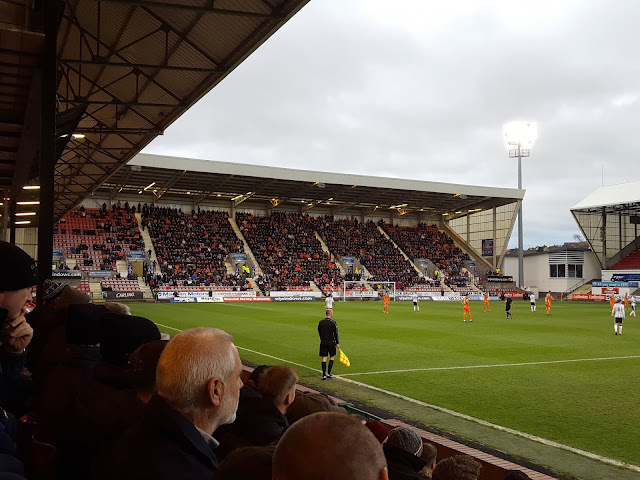 The match was Dunfermline vs. Dundee United in the Scottish Championship Play-Off Semi-Final 1st Leg. 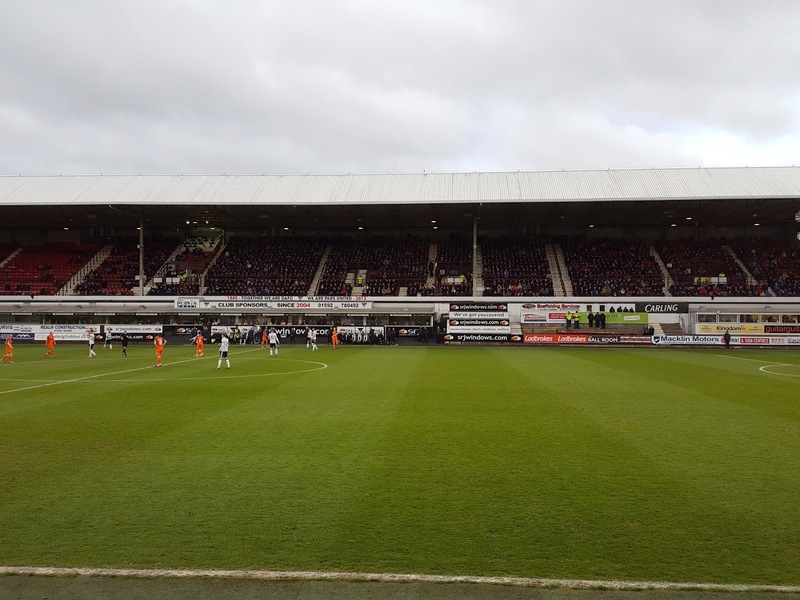 East End Park is located on the edge of the Garvock residential area east of the town centre. The site has a road separating it from housing to the south, an Aldi to the west, a cemetary to the north and a car dealership to the east. Three-quarters of a mile north-east of Dunfermline Town railway station, the venue has been home to the club since 1920 when they moved having occupied a separate stadium at East End Park just to the east of the current ground. The South Stand is considered the 'main' side of the ground. This stand includes the reception, a ticket office and a smart club shop which looks newly refurbished. The spectator areas facing the pitch consists of an upper seating deck of just over 3,000 seats which includes a media section. There are a couple of supporting beams to hold up the roof that sit in front of this seating deck. The lower deck used to have approximately 1,000 seats bolted onto an old concrete terrace which were split into two sections by the dugout area. In 2002 these lower deck seats were removed and executive boxes were added in their place for most of the length of the pitch. These are similarly split into two sections with a disused terrace section in the middle. This all gives the stand an unusual appearance with the hospitality boxes so low down. Level with the bottom of the box windows are the top of the two dugouts by the half-way line. The opposite side of the field has the North Stand which has the shortest height of the four stands at the ground. This is the most dated structure and has lots of supporting beams in amongst the seating to support the roof. There are around 2,400 seats with a flat concrete area at the back. There is a also a TV gantry above the seating in the middle of the stand. The design of the stand means it retains sound very well generating a great atmosphere for this game. 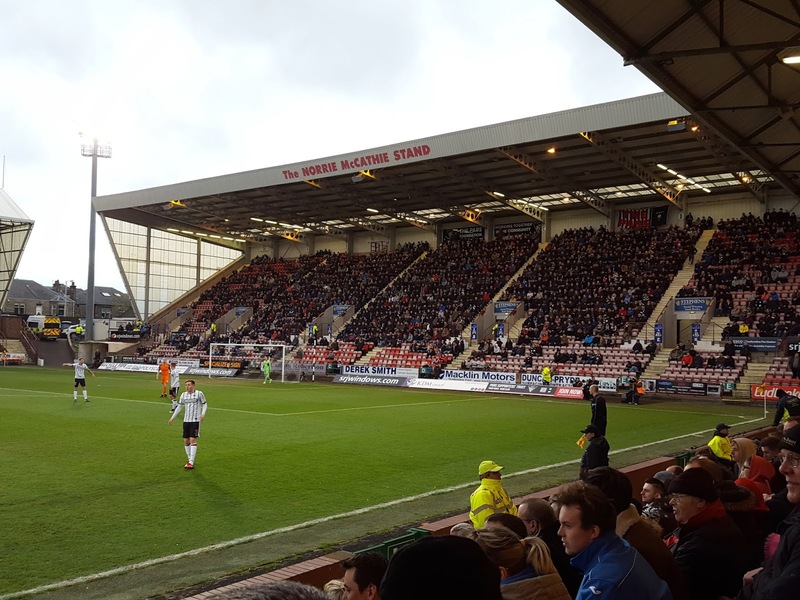 The two stands behind the eastern and western goals are near-identical with the only obvious differences being the police control box in the south-east corner and the player's tunnel in the south-west corner. Both stands are large single-tier structures that were constructed in 1998 to replace uncovered concrete terracing. Each offers uninterrupted views and have 3,016 seats apiece bringing the venue's current capacity to just under 11,500. 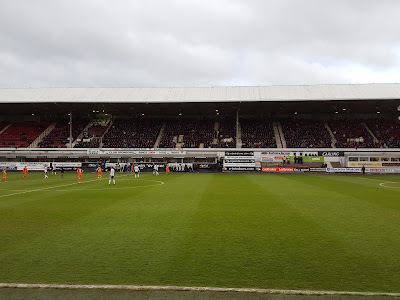 With the sides having finished 3rd and 4th in the Scottish Championship this was the first leg of the first stage of the play-off process for the Scottish Premiership. The hosts appeared much more up for the game and were clearly the better side in the opening half. Fraser Aird consistently caused Dundee United problems down the right and at the middle of the half his fizzed ball across the box just needed a home boot on it to nudge the ball home. As it was two defenders and one striker all collided stretching for the ball and the danger was over. The best opportunity came in the 38th minute - once again it was the inventive Aird who crossed in the ball from the right and Declan McManus' looping header from the six-yard line beat the keeper but not the crossbar. The ball bounced down and the rebound was knocked over the bar as the two sides went in level at the break. The hosts began the second half in a similar vein and went close again when Fraser Aird's 25-yard curling effort was acrobatically tipped over by visiting keeper Deniz Mehmet. The big moment of the match came in the 55th minute when a long goal kick by Mehmet was poorly defended leaving Dunfermline's Lee Ashcroft and Dundee United's Scott McDonald as the last two men before goal. A tangle ensued with McDonald going down fairly easily but referee Bobby Madden had no hesitation in producing a red card for Ashcroft. This turned the tide of the match and the away side were now the ones in the ascendancy. Scott Fraser flashed a shot just wide of goal from inside the area and an excellent save from home keeper Lee Robinson denied McDonald's low shot from 12 yards. 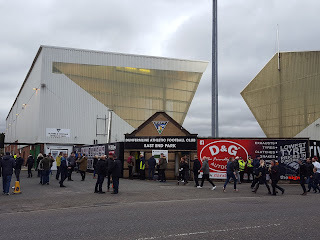 Dunfermline were not done though and shortly after a free-kick into the box found the head of Nicky Clarke but with the goal seemingly goalbound Mehmet leapt across and palmed it away. In the 72nd minute Billy King was unleashed in on goal for the visitors but the keeper narrowed the angle well and his cross was deflected away before King's advancing teammate could knock the ball into the vacant net. The rest of the game was an end-to-end affair as both sides went for it in what was an exciting game that was only missing goals.